Here’s a Statue Park puzzle, with a full set of pentominoes. I made this one on the train back from the WPC in Senec, I still plan to post some thoughts on that some time. In other news, I’ve been writing some puzzle sets for Nibbl (Android, iPhone). It’s an app that works as a solving interface and marketplace for handmade puzzles. See also Rohan’s announcement from earlier this year; the interface has been improved quite a bit since then. If you use my referral code ROBR9402 (or someone else’s), you’ll start with 100 credits, with which you should buy some of my star battle or skyscraper puzzles which came out pretty well. I won’t stop posting here, though, don’t worry! 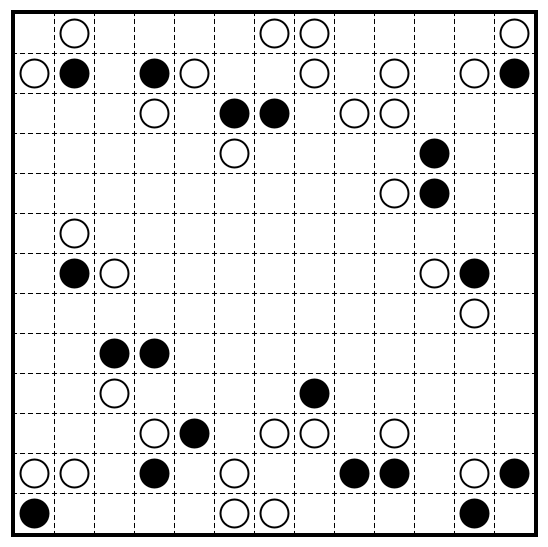 Rules Place a full set of twelve pentominoes in the grid. Different pentominoes must not touch along an edge; they may touch diagonally. Black circles must be part of pentominoes, white circles must not. All cells that are not part of the pentominoes must be connected by edge. This entry was posted in Puzzles and tagged hard, nibbl, spam, statue park on 2016-11-03 by rob.